Learn the hand-drawn and hand-lettered techniques needed to make your next meeting visual. Available in 1 & 2-day workshops. Your entry into the world of visual language. 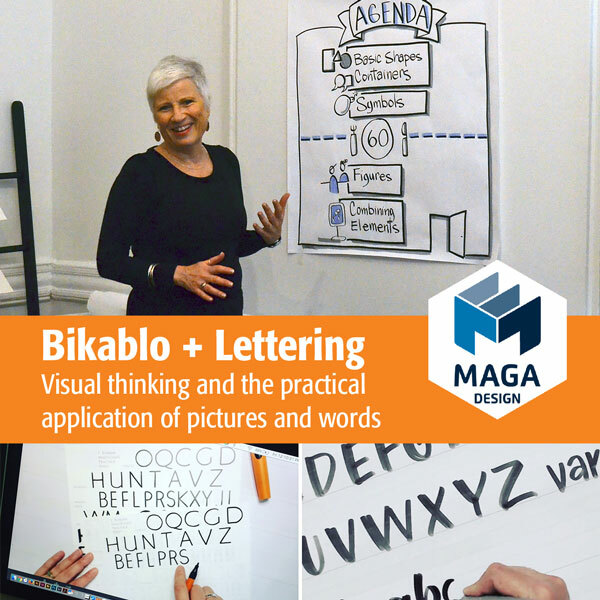 Lay the foundation for your future as a visualizer: Step by step, using the pictograms, figures and graphics elements of the bikablo technique, you will acquire basic knowledge of visual language for flipchart and work at the wall. And you will design your first presentation posters, which you can put straight to use the very next day. In a relaxed learning environment, you will experience just how easy it is to make even working large eye-catching and lively, using simple tricks. Jill takes a lot of time letting you in on the secrets of the bikablo visualization technique, demonstrating how to draw details for you and answering your questions. Is your writing legible? stylistic? Do you feel confident when writing live in front of others? If you write in real time during meetings, it’s likely you rely on your handwriting for rapid capture which can range from okay to horrific. Regardless, you are just one-day away from feeling and looking great in front of your colleagues and clients. Your confidence will build as Heather guides you through a series of exercises that will support the practical applications of lettering complimentary to Bikablo pictography and techniques.